Once the user connects to a Wi-Fi network, the AP or controller redirects to the captive portal page. 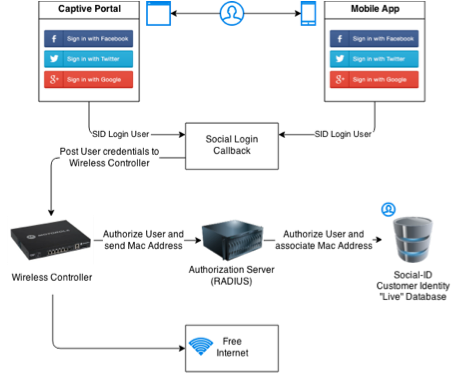 The user can log in using a social network or traditional credentials and the social login callback posts the user credentials to the wireless AP or controller. The AP or controller must be configured to authenticate the users through RADIUS authentication. A RADIUS server and a client secret are configured and queried when an authentication request arrives. The Social Login RADIUS server authenticates the user and replies to the wireless AP or controller, which opens the Internet to the user and redirects back to some welcome or portal page. From this point the user can enjoy a free Internet. RADIUS server host or IP address: the hostname or IP address of the Social-ID RADIUS server responsible to authenticate users. RADIUS server authentication and accounting ports: the authentication port of the Social-ID RADIUS server responsible to authenticate users and accounting port of the Social-ID RADIUS server responsible to collect accounting information. RADIUS client secret: the secret shared between the RADIUS client and server. Captive portal URL: the URL of the external login page where the users will be redirected to. The RADIUS server can be configured by hostname or IP address. We recommend to use hostname instead of IP address if possible. For these cases we'll setup custom ports for authentication and accounting, and a unique client secret for each customer. These parameters are specific for each customer. Contact us to get more details. In order to enable social and traditional logins you need to configure a list of URLs that the users can access without being authenticated in the Wi-Fi network. Get the list of URLs. This page was last modified on 14 March 2019, at 13:19.